At half-time in the game at the KCOM Stadium yesterday evening a lot of us Rotherham United fans were fearing the worst. One down after one and a half minutes then conceding another twenty-one minutes later to go in at the interval two down was, to say the least, disappointing. From the off the Millers looked uncomfortable in what, to us looking on, seemed a peculiar formation, which the Gaffer says was three-five-two, but looked more like one-seven-one-one to us in the stands, which was changed a little towards the end of the half when Anthony Forde came on for Jerry Yates. Fetching Jon Taylor on at half-time was nothing short of a miracle – his running down the wing was phenomenal last night and Hull City looked stunned and could hardly contain us. And, actually, we could have scored more the way we pressed in the second half. For me, the KCOM pitch looks wide so it was really crying out for wingers, so it was a bit of a surprise Warney started with his wingers on the bench – saying that, he did the same thing at Millwall and we kept a clean sheet and got a point there. At the end of the game every Millers fan in the stadium stood to applaud the lads on the pitch and we came away with big smiles on our faces – anyone not knowing the score would surely have thought we’d won not just got a point – and we weren’t expecting to be like that at half-time after probably the worst forty-five minutes of the season. Since coming home I’ve looked at some of the comments on Social Media and I’m expecting there will be a few people on there who will have very red faces this morning. 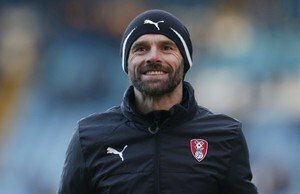 The draw has to give the Millers a boost ahead of our South Yorkshire derby on Saturday – a football match in which we have to start on the front foot and take the game to the Owls. Mr Warne – I thought you got it dreadfully wrong in the first half but you saw that and changed it so it’s a big ‘well done’ from me. I actually think the captain was at fault for the first goal, or at least wasn’t anywhere near his marker to stop him getting a shot in. It is good that Warney can change it and that we’ve got back to the mode of being able to fight back.